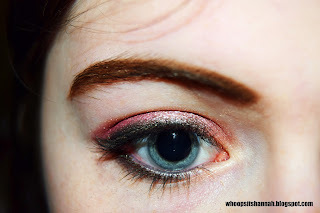 Today's post is a tutorial to show you how to get this pink eyeshadow look, which I think is perfect for spring. I tend to go for browns and golds usually, so this hint of subtle colour was a welcome change for me! To see how to get this look, keep reading! I started with my base: primer (The Body Shop 'Matte It'), concealer (Seventeen 'Stay Time' in 'Extra Fair') and powder (Rimmel 'Stay Matte' in '001 Transparent'). I then filled in my brows using the Freedom brow powder duo in 'Dark Brown'. 1. Prime the eyes with the Maybelline '24 Hour Colour Tattoo' in the shade '65-Pink Gold'. This will help your eyeshadow last longer. Next, take a light pink shade in the inner corner and halfway across the lid. 2. 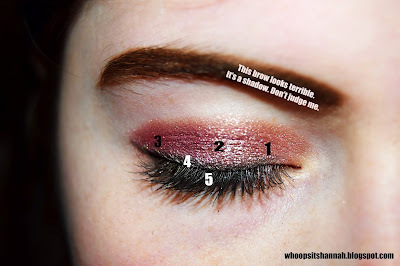 Take a slightly darker pink across the other half of the lid and up into the crease. 3. With a very bright pink shade, create a 'v' shape on the outer corner of your lid. Take this into the crease as well, stopping in the middle. Blend all three shades together. 4. Keep the eye definition fairly subtle by going in with some black eyeshadow on an angled brush, and taking this all across the lashline. For a hint of drama, add a little bit underneath the bottom lashline as well. Use a black kohl pencil - I use the Barry M ones - into the waterline for extra definition. 5. Finally, use mascara to lengthen your lashes. 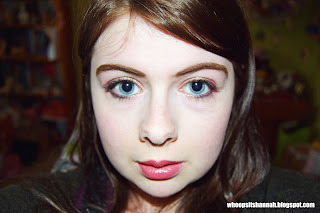 I used the Maybelline 'The Colossal Go Extreme' in 'Very Black', and used only one coat as I wanted my lashes to look fairly natural and fluttery. For the lips, I combined two Revlon lip butters in the shades '045 Cotton Candy' and '050 Berry Smoothie'. Finally, I added some L'Oreal 'Glam Shine' lipgloss in the shade '171 Sheer Pink' over the top for some extra shine and shimmer. Let me know what you thought of this tutorial in the comments, as well as what posts you'd like to see next! I'M CUTTING MY HAIR FOR CHARITY! I Need More Skincare Products!